Yesterday, I promised an update, so here I am with an update on our progress. Normally, I would share “Before & After” pictures. But problem with that is, even though we’ve done a lot, it is seems like there are still a few little things that still need to be done in every single room. So no room is ready for an “After” picture. That’s why all my “Before & After” pictures this time are “Before & Progress” pictures. Anway, here’s just a little peek at what we’ve done so far. I am so excited about our kitchen! We found an Amish cabinet maker who made our cabinets for us, and they were installed about two weeks ago. Now, I’m working on painting them. They require a lot of coats, because I chose yellow for the cabinet color. In order for the yellow I chose to look right, the cabinets need to have at least five coats of paint. I have two more coats of paint to put on the cabinet bases, and then I’ll start working on the cabinet doors. 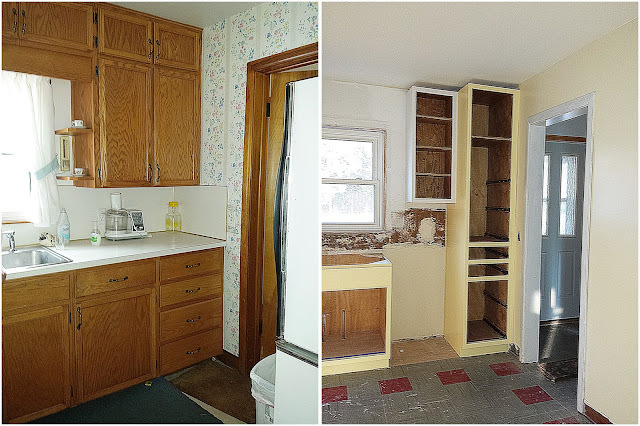 How the kitchen looked when we first saw our house, and how the kitchen looks today with the new cabinets going in. I’ve started painting them, and I’m in love with the color! What still needs to be done? Well, finish painting the cabinets, install the countertops, install the subway tile, and install the flooring. 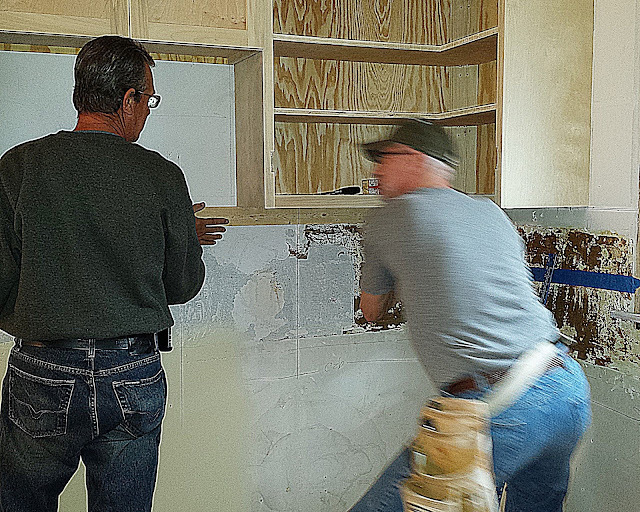 Then, we’ll have contractors come to do the electrical and plumbing. It sounds like a lot, and it is. That’s why the kitchen has become our top priority. The hallway was a challenge. Somehow, and I have no idea how it happened, but I forgot to sand the trim. I thought I had sanded it all, but after the paint dried, it scratched right off. I was so annoyed with myself that it took a few weeks…maybe more like over a month…before I convinced myself I had to strip it all off, SAND them, and redo the painting. As you can see, the trim is all painted now AND it’s not scratching off! How the hallway looked on the day we took possession, and how it looks today. Now all that’s left to do is install the baseboards and the vent cover. The electrician has an outlet to install, but that will be done with the kitchen work. The doors will be a project for another time, because they don’t go with the new laminate flooring. How the living room looked on inspection day, and how it looks today. I seem to be painting every single day. 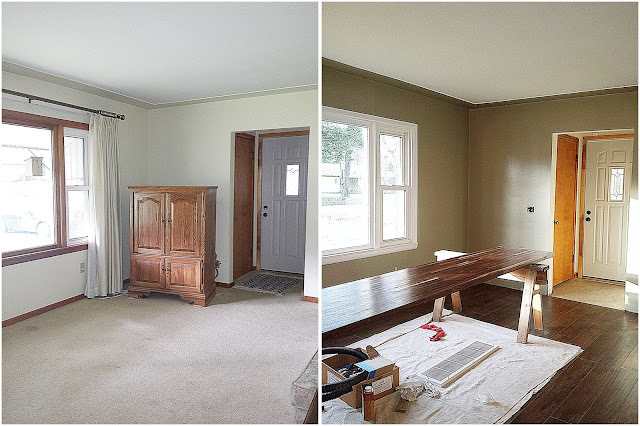 The living room got a fresh coat of paint today–actually two coats of paint today. 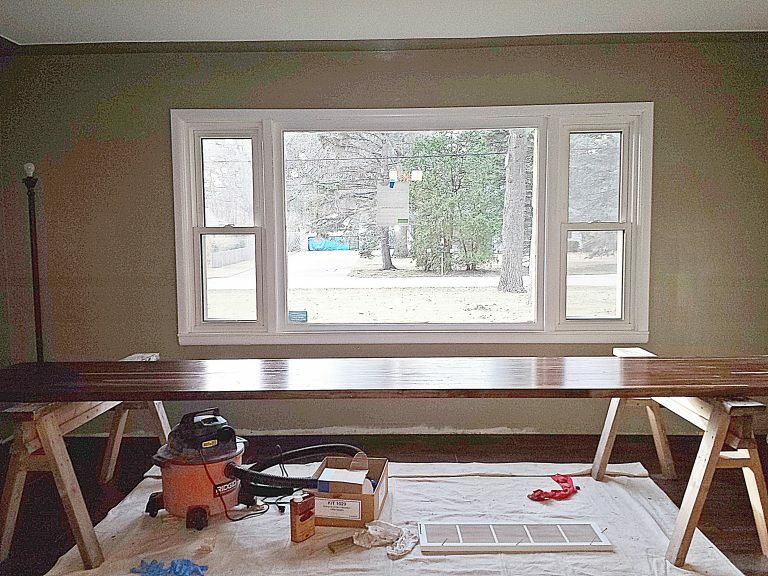 I painted the trim yesterday, and I did remember to sand it before painting this time. I love the way the white trim looks against the color of the walls. The contrast is perfect, and looks so clean. Just in case you’re wondering… That board on the saw horses is the countertop for the kitchen. It’s just waiting to be installed. It feels so open now, and I love how the trim turned out. Here’s another view of the living room. It gives you an idea of how open it feels now. Before, that opening was a solid wall. Now you can look all the way through to the dining and family rooms. 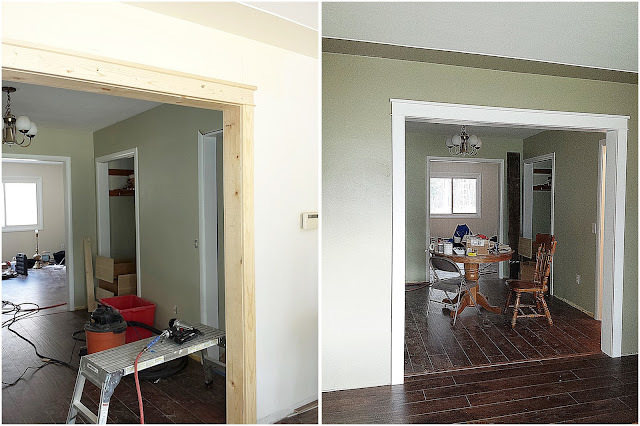 Last weekend, we trimmed out the opening, and eventually, we’ll change all the moldings to match the new trim. But that’s also a future project–probably one room at a time. 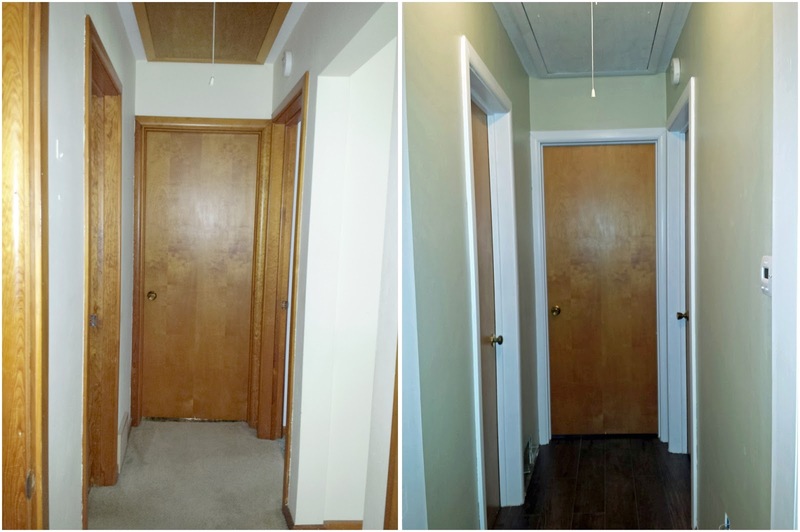 Baseboards are needed in just about every room…master bedroom, family room, dining room, living room, hallway, and kitchen. We want nice thick baseboards that are at least five inches. They might end up being a one room at a time project also. The fabric I’ve selected for the family room. One more little update. I ordered the fabric to make curtains for the family room. 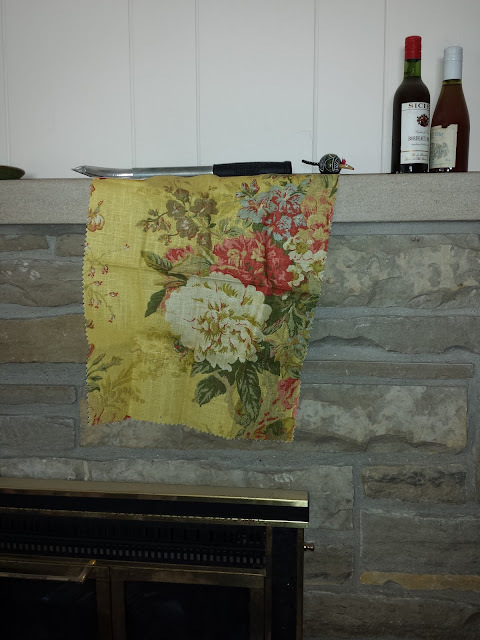 I had selected another fabric, but when I put this one up against the fireplace, I just went “WOW. That’s it!” Honestly, the picture does not do it justice. I’m excited about the progress, and I’m trying not to think too much about all the things that still need to be done. Well, I’m trying not to think about them all at once. One day at a time. Every step is a step closer. And remember… Sand paper is your friend!!! Trust me on this one.